Have you ever wondered how fabrics are made, have you ever wanted to create your own colors with things around you. In this 2 day workshop join Mr. Arun Baid and our master dyer to learn about organic cotton and natural dying. Workshop participants will learn about fiber to fabric conversion process, recipes for making dyes, dyeing techniques, future commercial prospects and much more.Visit to the factory premises , get a chance to see the industrial processes of natural dyeing techniques. What’s more you get to make your own t-shirt or scarf using these natural dyes to take home. All required supplies and lunch will be provided. There are limited seats so register now to ensure your spot. Calling in all enthusiasts to join our efforts to create a safe, pollution free and a sustainable living. This is our way of knowledge sharing covering various aspects of Organic textiles & natural dyeing like . This workshop will be great for any one who wants to know the textile processes as well as interested in how natural dying works in small as well as large scales. We would like to invite designers , students and design academicians to participate. Below is the plan. We are sharing our years of experience with the students & hope it come to use to them. (B) Dyeing with natural colors. (C) Variation in dyeing and QC. (A) Blue , Yellow , Red , Black, Brown. (B) Plain dyeing / Tie – dye in the dye bath. (C) Souvenir Choice and preparation. (B) Herbal Products / Mordents etc,. This is our 2nd work shop & hope to have many more. We shall soon be coming up with residential design courses for designers & students. Tags: Ahmadabad, aura, aura herbal wear, auraherbalwear, designers, eco awareness, eco-friendly activities, herbal dyeing, herbal dyes, low impact dyeing, natural dyes, organic cotton, sustainability, sustainable processes, sustainable textile proceses, sustainable textiles, trainers, training, truly eco processes, workshop | Permalink. They may shy away if we call them Heroes, but that is the kind of work they aspire to achieve. Our team Auracle, the team that we fondly call our Green Commandos, are gearing up to make a difference with their fresh green ideas. They are merely a set of teenage girls that are tired of sitting around waiting for things to change on their own. All of these youngsters feel deeply about the situation of our society wherein we are exploiting the environment to lewd extent. And between Auracle and Aura, it is a match made in heaven! Auracle is ready to do what it takes to make being “Eco-friendly” fun and happening, and we are ready to provide for whatever helps cultivate a Green culture in the society. Through Auracle, we wish to fulfill one of our chief targets: bringing the society and the environment together, creating a balance between the two so both can survive conjointly. Auracle, being an independent body, plans to do what it can for this city. Meanwhile Aura provides all the resources that it can. Already this group has held two workshops with the help of our material and their own zeal. One workshop was in affiliation with Mahatma Gandhi International School, wherein they taught disadvantaged children the importance of cloth bags, as opposed to plastic bags. They provided cloth bags to the children, on which the children stitched a patch which was hand-painted by them, using herbal paints. As it was in memory of late Mahatma Gandhi, the paintings were inspired by him. This combined the lesson of peace with the one on the importance to switch to cloth bags. In the future, Auracle plans to make many such workshops with school and college going youngsters to reach out to the generation of tomorrow; the generation that is their own. Their second workshop was on the technique of tie-dye using herbal colours and organic clothing. This was held right bellow our retail store, at the Auracle headquarters. Arun Baid, a director at Aura as well as a dyeing expert, taught willing individuals this wonderful technique. Each one customized their own scarf/t-shirt/bandana which they later took home. 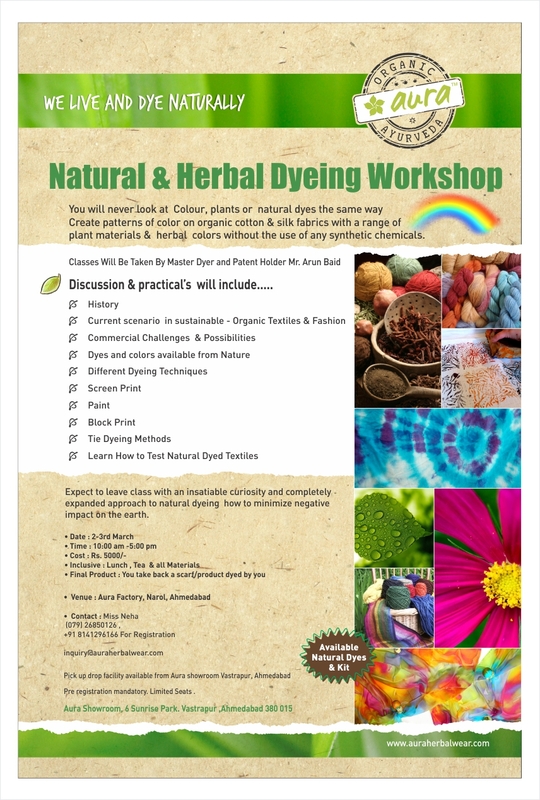 This workshop was held with the aim to revive tie-dye techniques, as well as introduce individuals to herbal and completely chemical-free colours. The response that team Auracle has received from these two very simple workshops has given them tenfold of energy to continue their efforts, however big or small they may be. They wish to make their interaction with the society interesting and enjoyable, as well as reforming and informative. With their new ideas, and their chirpy personalities they are sure to touch the lives of Ahmedabad’s citizens, and help Aura stay in touch with the bigger picture. Tags: aura, aura herbal wear, Auracle, eco awareness, eco-friendly activities, green commandos, herbal dyes, organic clothing, social awareness, Social work, workshops | Permalink. It is not true that some of us do not have beliefs. If we did not believe in something, something that is eternally true for us, we would not be able to differentiate our right from wrong. We would not complain at all and neither would we be satisfied, our mind would never be unsettled with happiness or gloom. How would it be, if there was nothing that stemmed this awareness? Because even believing in nothing, is to believe in something. At Aura, we believe in something. Something that we know is larger than us. With this belief we find our strength to fight for what we stand, we find the route by which to fight, and we find the peace in living. It would be too simple to say that we believe in Aura. Aura is the result of our beliefs and not the other way around. Aura is simply the perfect fit for us to be able to sport what we believe in, and thus we believe in Aura. So what is it that we believe in? Is this our take on saving the world? Our way in amending strayed human paths? Our effort in bringing back all that is good to a world that has forgotten it? Are we here to open eyes and spread the light? We are here purely because we see a possibility of change. Yes we want the world to open its eyes and correct its ways, but that is not what drives us. We are a company that cannot do something for a living that jeopardises lives of any beings. What disgusts us is exploitation and discrimination of nature as well as the society. For us the two are at par, and that is what we believe in: bringing nature in equilibrium with the society, and if required, the other way around. It would be wrong to misinterpret our love for the moral to be our love for nature. Our love for nature roots from the peace that it portrays, because it is the peace that we preach. And in this way, when we see that a change is required, we will make our efforts to bring it, because we love a good challenge and we scoff at impossibilities. Tags: aura, aura herbal wear, belief, change, mission statement, vision, vision statement | Permalink. Materialism has a negative connotation: A materialistic human does not concern self with spirituality, is limited to worldly possessions. He does not bother to look beyond what he objectively has and what he can get. Not only is he selfish, he is also short sighted with a limited perspective to the beauty of our world. All of us are materialistic. All of us desire possession; we derive satisfaction with achievement of tangible items. We desire items that give us our status, our pride and power, and are the conceivable result of our work. What is wrong about wanting a large house that is luxuriously comfortable when you have worked hard to obtain it? Is it such a crime to be able to provide for all that our children want? Why can’t we buy a car that is worthy of our status? Is it that wrong to “want” when you have toiled hard for fulfilling those very wants? Why should we be the people who fulfil wants sensibly when every where around the globe people throw around money? We are taught from the very beginning that greed is a sin and that these wants never end. It is a vicious cycle of wanting newer and better things, which only ends up making desires harder and harder to fulfil. But the truth is being materialistic is human. To want the best and the most for yourself and your loved ones is natural. Yes we would be happier in a world where people wished for happiness and peace rather than bigger and better homes and machines. But without desires there would be no moving forward. We would be satisfied with the least, happy with everything being as it is. Creation would come to an end because there would be no need to create. What we make out to be a sin, is also our fuel for evolution and for growth. That we desire is inevitable, and to attempt to fulfil these is natural. But what are we ready to forsake for these wants is really what we should focus at. In order to fulfil these wants we do not just pay by means of money. We pay for how these wants harm our planet, our communities, our societies, our Home. And here we need to redefine how we want a better future for the ones we love and the planet we love. It is hence not incorrect to want. But to want blindly and ignorantly is a mistake. Before we destroy our collective Home because we were too busy fulfilling personal wants, we need to want what is best for this Home. If we go on with our lives without regarding the looming responsibility to want responsibly, we will bash into the thick Wall of Consequence with no turning back. This wall is not something to be threatened by. All we have to do is want not to ever have to face it. There have to be alternative solutions to our materialistic possessions. There have to be options that balance out what is best for us as well as for the planet and society. Some ideas such as Aura’s are on their way to making these solutions big and prominent. Catering for a common need such as garments that are made in the way there were always supposed to be made. Fabrics made with natural colours and processes. Eliminating harms that chemical processes place on our Home. It is not difficult to find alternatives. It is pretty simple in most senses. You just need to want it enough, like we do at Aura. Tags: aura, aura herbal wear, consumerism, herbal dyes, materialism, materialistic, natural, needs, wants | Permalink.